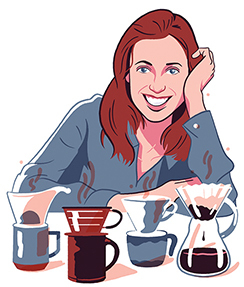 After her daughter, Cami Fussey, created a coffee festival in Michigan, Ilene Ross worked with her to replicate the showcase by featuring the best local coffee roasters and cafes in Cincinnati. Where did Pour Over Cincy/NKY come from? It started in 2015 in Ypsilanti, Michigan, when Cami and a group of her friends got together and decided to promote the coffee roasters in Ypsilanti, which for a very small town outside of Ann Arbor has a very large number of them. I went up to help her with her first festival, and it was so incredibly successful that we decided to bring it to Cincinnati. How has the festival grown? The first year we had about 250 people. We had about 16 coffee and food vendors, everything from pour overs to nitros to things that looked like giant chemistry sets. People really bought their A game. You really get a full experience of what coffee is and how it’s made at the festival. I think people deserve to know what it takes to make a great cup of coffee. What can people expect this year? Everyone is really looking forward to the festival this year. It is held at The Hatchery, the incubator kitchen at St. Paul’s Episcopal Church in Newport. We like to include both sides of the river to make it a truly community event. The roasters get the opportunity to educate and spend more one on one time with their customer as opposed to the time it takes to make a quick sale in store.